Consider a case, Shyam is from Raipur – He has come to Mumbai for better opportunities is now earning a monthly household income is Rs 10,000 to Rs. 20,000. Can he buy a 1BHK home which costs around Rs.10 Lakh to Rs. 25 Lakh in Mumbai (for that matter even in Mumbai suburb)? The answer is NO. How many such people are present in urban areas who cannot buy a home due to smaller budgets? The answer is 21 million (21% of the total population)!! 2 What is different about it? 3 What do Housing Companies look at? 4 Which other allied business are benefitted? 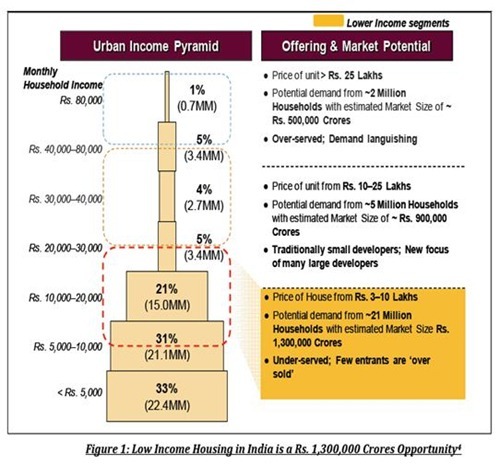 Technically, affordable housing is defined as houses targeted to population with Income level < INR 1.5 to 3 Lakhs with demand of around 300 to 600sq ft as dwelling area. The EMI to monthly income is generally 30 to 40% and House price to annual income ratio should be less than 5.1 percent (Deepak Parekh report). The affordability does not compromise on Quality of construction and Provisioning of socio–economic infrastructure. It is evident that there is huge unmet demand for affordable housing in India since the premium section is witnessing an oversupply. This leads to big opportunities with even bigger returns for the developers. In return the builders provide fringe benefits in the form of better access to facilities, higher standard of living, and better environmental aesthetics. These houses are made in the outskirts of the cities. For example, Tata Housing is constructing Shubh-Griha in Boisar (more than 1 Hr from Mumbai’s lower end). These flats are available from Rs. 4 Lakhs to Rs. 6.75 Lakhs. The main benefit is that the land is cheaper and government provides interest rate subsidy, Resumption in 80 IB, awarding higher FSIs, etc. What do Housing Companies look at? Housing companies want to position this as need based housing or Value Housing. They ensure that buyers are the end users. They discourage investors to buy property by introducing specific clauses in agreement, restriction to resale until possession and huge transfer fees if the property is resold. What concerns them delay in regulatory approvals, hassles in land acquisition and availability of cheap land. Which other allied business are benefitted? Like normal housing companies, they have tie-up with major banks. Interesting thing is few of their customers come from NIP (No Income proof) category to which commercial banks don’t service Home Loans. Here Special Housing Finance companies like MHFC (Micro Housing Finance Company) and MAS Financial cater to this market charging a premium in the interest rate. Time will tell if their business model is strong enough. While the concept of affordable housing seems to be a simple solution to current housing woes, its execution remains complicated due to the unclear policy framework. 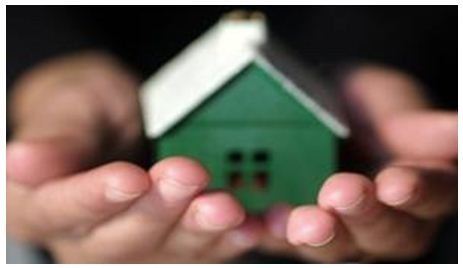 To make affordable housing work in India, it would require “will” from all the stakeholders by slightly adjusting their interests towards a wider social cause. Whats you take on Affordable housing in India? http://DealFlats.com attempts to make apartments affordable to a certain extent by offering real estate deals for group buying.